Tennis is a year-round sport at Newington. In the Summer Season, boys compete in the AAGPS Competition as well as Age Group competitions. Every student participates in a comprehensive training and competition program that caters for all playing levels. Tennis is a year-round sport with a summer and winter program. Summer has a AAGPS competition as well as an Age Group competition. The winter tennis season caters for beginning players as well as supplementary training for performance athletes. At Newington, each tennis student participates in a comprehensive training and competition program that caters for all playing levels. The Director of Tennis is supported by dedicated internal staff, and by a team of qualified and skilled coaches and assistants. The college boasts a world class facility that consists of 6 Australian Open Hardcourts, as well as 3 multi-purpose synthetic grass courts. There is a shaded viewing deck as well as a tennis office, club room, and bathroom facilities. The courts have recently been resurfaced and have hosted Tennis Australia tournaments and coach education courses. Courts are available for social use by students, staff, family and friends, subject to court availability. Each student is required to participate in two training sessions per week, as well as play in a team competition fixture each Saturday. AAGPS teams are required to commit to additional training including strength and conditioning. The boys have representative opportunities with the AAGPS, CIS and as part of school tournament tours. 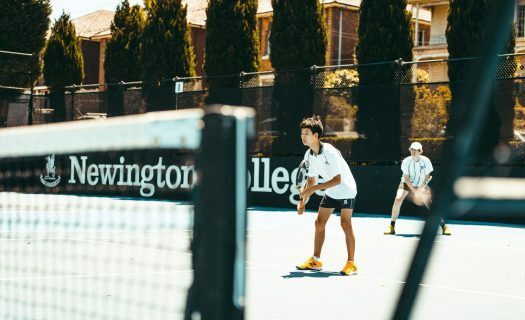 Newington College continues to conduct tournament tours to expose our Performance and Aspiring players to competitive tennis outside the school system. 12 Newington boys travelled to several tournaments across NSW in the school holidays. Many of our leading players also compete internationally during the offseason. The pathway to the ITF/ATP Protour, or to a US College athletic program, is carefully integrated into the GPS tennis program at Newington. The 2018 Tennis Season was a fruitful one, with both the 13’s and 14’s age groups boasting 30+ players in each division which bodes well for the future of tennis at Newington. In the senior teams, there were also very healthy numbers with 10 teams across the opens divisions competing each week. For the 15’s and 16’s age groups some new initiatives and policies were implemented which proved to be both confronting and nourishing in terms of culture and development. Without doubt the GPS squad was the highlight. The 1st were undefeated in capturing the GPS Shield, while the 2nd finished a respectable 3rd place. The Newington Tennis contingent also secured the NSW All School State Teams Championship, Top 6 representation, and CIS representation. Paul Howe (Captain of GPS) and Jun Sasagawa were part of the winning NSW Pizzey Cup team at the prestigious Australian National Schools Team Tennis Championships, open to statewide high school students. Jun was also selected in the All Australian Team which will attend the Australian Open in 2019. This adds to Jun’s impressive record of going undefeated in Singles playing at the no.1 position all year. Alec Machin won the ONU Service Prize for Tennis. Tennis Camps and Private lessons will now be conducted by the school, operating under NewSport. Information will be send out leading in to holiday tennis camps. For all enquiries about private tennis lessons, please email the Director of Tennis, Chris Steel.